Song of the day: Rod Kirkham – "I Can’t Get Sunday Out Of My Mind"
Sorry about the sound quality of that MP3, but it’s the best I could find. Update: Thanks to the fancy electronic footwork of two individuals – Thirsty Mac, who had it (Hi, Thirsty!) and Tom Mix, who ripped it in the first place (Hi, Tom! ), I now have a version of the song that may be better than the one I had. (I’m not entirely sure it sounds “better”, but it does sound different.) Thanks enormously, chaps! By the way, if you’re wondering which of the people in the photo* is Rod, it’s the chap in the turtle-neck sweater (second from left). 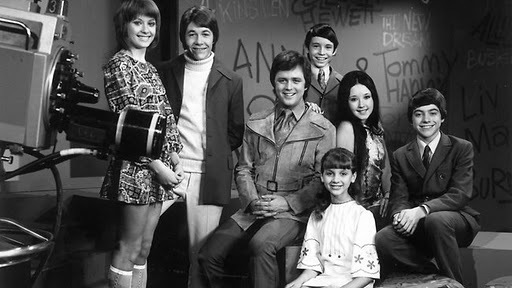 And if you’re wondering who all those people are, they were members of TV show Young Talent Time, a program from the 70’s and 80’s that highlighted Australian young’uns singing and dancing on TV screens across the nation. It was hosted by the chap in the middle of the photo, Johnny Young. The show was a bit like American/Australian/UK Idol, full of young people bursting with enthusiasm and varying degrees of talent, but the program was incredibly wholesome and had none of the nastiness of the modern talent shows. (“You’re out!”) Wikipedia reckons Young Talent Time was like The Mickey Mouse Club. I never saw that, so I’ll have to take their word for it. You are currently browsing the archives for the Changing Scene category.